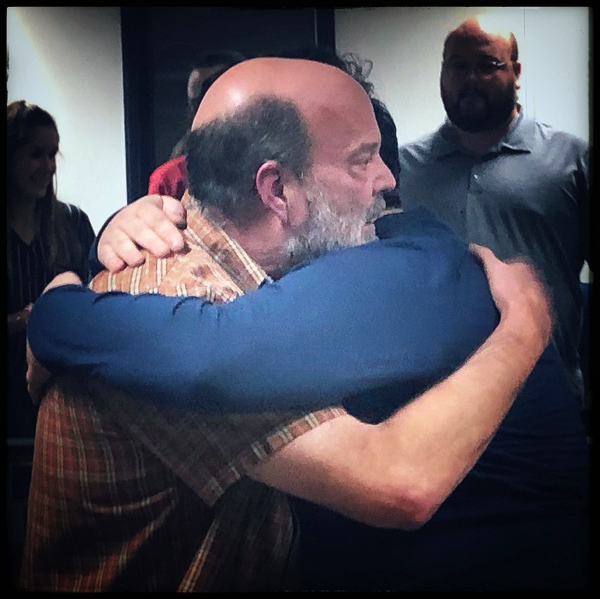 Golden Apple nominator Greg Landeis wrote, "In the spring of 2018, I witnessed my son graduate from Soldotna High School. You might think this is a great feat since thousands of kids graduate from high school each spring. However, my son was diagnosed with severe ADHD and Tourette syndrome at a very young age. He had an IEP throughout school. My wife Esther and I are older parents. She is a registered nurse and during a 25 year long career has cared for and saved numerous lives, and continues to administer care and compassion to her patients. I was a decorated veteran in the United States Airforce, and served my community for 20 years as a police officer before receiving a catastrophic injury while in the performance of my duties that left me permanently disabled. We are no strangers to the sacrifices one makes to help community and fellow man. This is a story of Soldotna High School educator David Justice, who went beyond what is expected or required to help directly save a life. When he became a freshman, my son suddenly started to change. Grades went down, his demeanor and attitude was sullen. This peaked when his mother walked into his room and found him with a loaded handgun, contemplating ending his life. To say his mother, a registered nurse and no stranger to seeing tragedy, and his father who had been dispatched to hundreds of suicides, were devastated and terrified would be misrepresenting the full magnitude of the situation. Our lives turned upside down. Our son was by our side 24 hours a day, seven days a week, for nearly a year and a half. We constantly monitored his mental health, and worried he would find a way to harm himself. He was academically at a standstill, and his mental health was to a point where he was not capable of being in a school environment. We tried home schooling but he continued to digress, and both of us were beyond worried about his future. During the summer between his freshman and sophomore year, he continued to struggle mentally and with his depression. His mother and I decided to pursue further testing. In the fall, with medication and some counseling, he was stable enough to go back to school. We met Mr. Justice when we worked with the school experts for his IEP status. Notice I refer to him as Mr. Justice—I do this out of respect and admiration. Little did we know he would not only save my son from further harming himself, but would relentlessly continue to speak into his life and eventually get him to a point where he could graduate with the rest of his class. So many times, Mr. Justice brought my son out of his depression, and dark place—a place my son describes as being overwhelmed with feeling unworthy and believing ending his life was an option. Mr. Justice built him up, and through creative and innovative techniques managed to motivate and give him the ability to realize his self-worth. Eventually he was diagnosed with Acute Anxiety Disorder and clinical depression, along with Tourette's and ADHD. The ability of Mr. Justice to speak into, mentor, and guide my son's life is not the entirety of this story. We were devastated by this tragedy in our child's life, and are interactive with all of our three children. Not only was this the most terrifying thing we had been through, we often felt very helpless and distraught, and leaned on one another for support, but sometimes it was not enough. Mr. Justice gave us great comfort through this whole process. Often times he would hear our despair and offer counsel, guidance, and reassurance. I do not think my son, Esther, and I are the only ones Mr. Justice helped. My son told me many stories of kids that Mr. Justice worked with and cared for equally as he did my son. Mr. Justice brought our son out of a world of torment, torture and self-loathing, got him on track, got him to push to graduate with his class and as if that was not enough, propelled him towards continuing his education through Job Core. I am no stranger to witnessing wonderful, selfless, giving human beings going the extra step to help someone, but Mr. Justice is at the very top of the list. This man restored my faith in the education system. His selfless and over the top dedication, in a very tough job should be commended. I will forever be in his debt for what he did for my son." 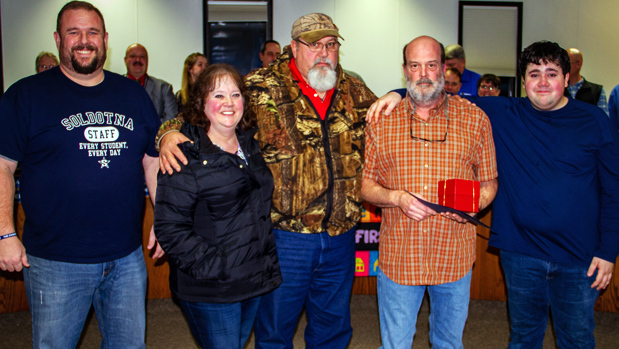 The Kenai Peninsula Borough School District Board of Education is proud to recognize Mr. David Justice for his dedication to the students of the school district, past, present, and future.